The What: Audio-Technica has introduced its new ES931 6-inch condenser gooseneck microphone, available in multiple configurations to meet the varied needs of system integrators and their end users. The What Else: There are three classifications under the ES931 umbrella: the ES931PM gooseneck microphone with standard AT8534 wall/ceiling plate power module; ATND931 Dante model with ATND8734 Dante wall/ceiling plate power module; and ES931/MIC basic model (microphone only). Each of these iterations is available in one of three distinct polar patterns (cardioid, hypercardioid, and MicroLine), with two color options (black and white), for a total of 18 different product models. The AT8534 wall/ceiling plate power module allows the ES931PM to be installed in a standard, single-gang electrical box. The ATND8734 wall/ceiling plate power module with Dante network output permits installation of the ATND931 in a standard, two-gang electrical box with direct connection to the ethernet network via a Cat-5e or better PoE cable. The ES931 offers superior off-axis rejection for maximum gain before feedback. Audio-Technica’s UniGuard RFI-shielding technology enables outstanding rejection of radio frequency interference (RFI) while the UniSteep 80Hz low-cut filter provides a steep low-frequency attenuation to minimize pickup of undesired ambient noise. 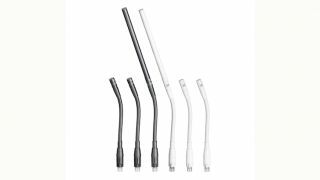 The 6-inch gooseneck presents a low profile design with a low-reflectance black or white finish for minimum visibility. The rugged small gooseneck retains virtually no "memory," permitting quick and easy adjustment into the desired shape and position. The Bottom Line: Intended for boardrooms, educational and government settings, teleconferencing, houses of worship, and other installed applications, each ES931 iteration is designed to provide consistent sound quality in multi-microphone installations with other Audio-Technica ES microphones.